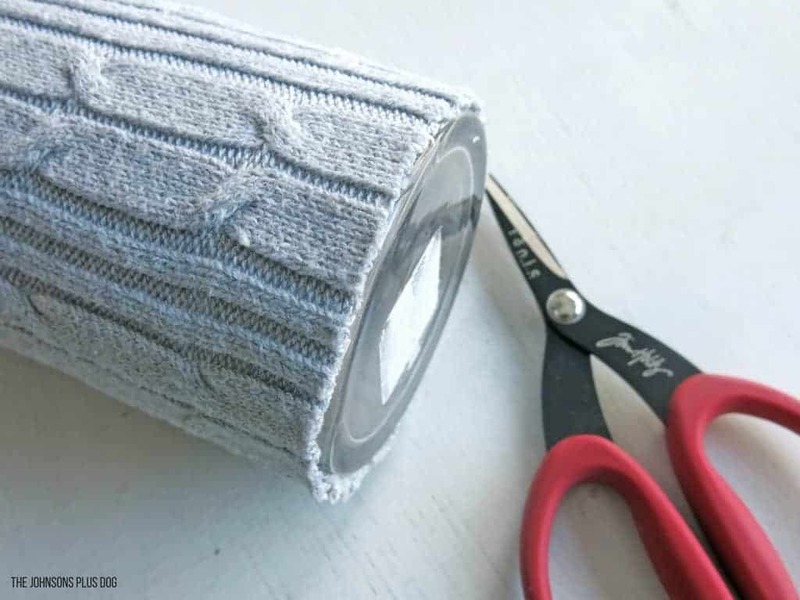 Cozy things up on your home for Winter with these DIY cozy sweater wrapped vases. 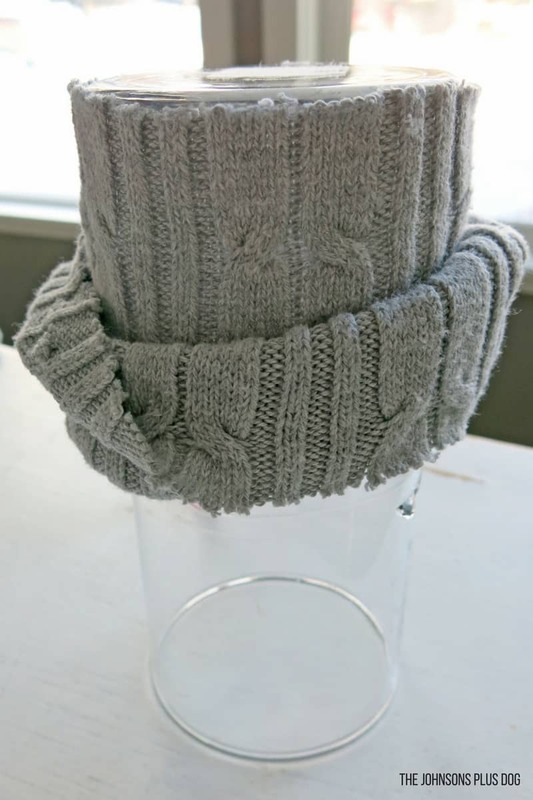 This simple tutorial for how to make sweater wrapped vases will get you ready for the chilly weather. Let’s have a contest. How much snow do you have outside your front door right now?? ?… hmm… maybe you got a few inches or so. Well… I win. I’ve got 2 and 1/2 feet….at least!!! We literally have just been getting dumped on for a few weeks without much melting! It’s been fun to sit inside and watch the icicles grow and feel like we’re in a snow globe. There’s nothing better than getting all cozied up with a cup of hot chocolate, chillin’ in your jammies and… working on some winter crafts, right?! As I’m getting all the Christmas spirit packed up, I’ve been working on creating some fun winter decor pieces so the house doesn’t feel too bare with Christmas decorations gone. 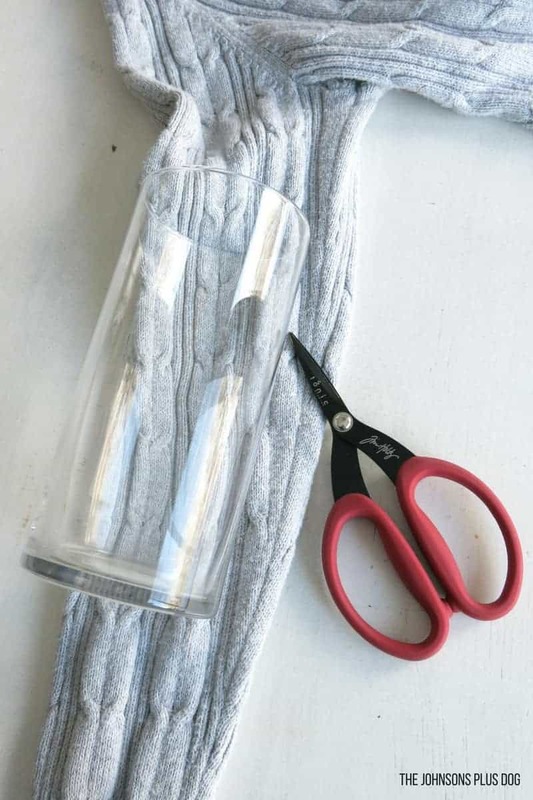 Tuesday I shared these fun DIY Farmhouse Cotton Stems that you can make for less than $2 and today we’re getting REAL cozy with these simple sweater wrapped vases. We need something to put those cute cotton stems in! UPDATE: Here’s the video in case you missed it!! If you love videos, be sure to check out my videos page to watch more. 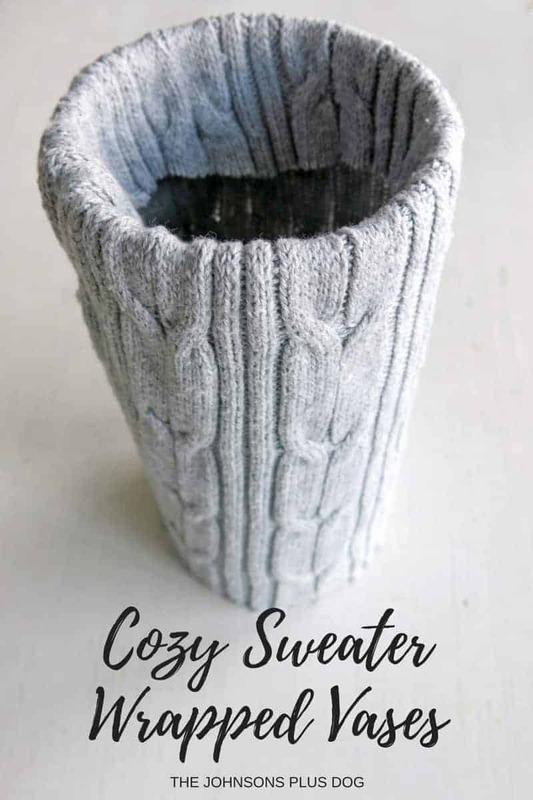 Are you ready to learn how to make these cozy sweater wrapped vases? Old sweater you don’t mind ruining. You can grab an old one from your closet while you’re doing the New Years decluttering scramble or grab one from Goodwill for a few bucks. Go for a larger size so you have more fabric to work with… what other ideas so you have for the extra sweater fabric?! I’d love the hear them in the comments. 3-in-1 glue… this stuff is amazing. It’s an awesome craft glue, think of it as a hot glue alternative. Fabric scissors… I love Tim Holtz Tonic scissors! Glass or plastic vase….again, I got mine from Goodwill for $1 each if you don’t have anything on hand. For my particular vase, the sleeve worked best to wrap around the vase. It fit like a glove, which made this pretty simple! 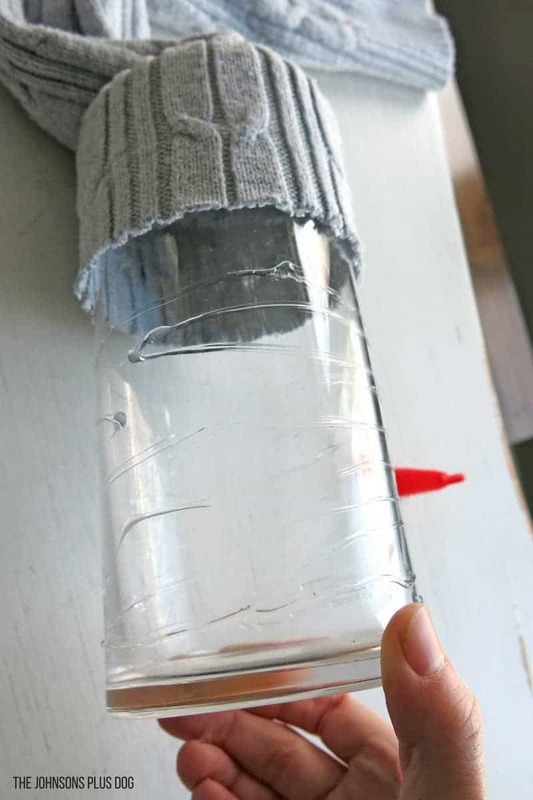 I started by putting the sleeve over the vase and lining up the end of the sleeve with the bottom of my vase. Next I cut the sleeve at the top, leaving about 2 inches of extra sweater after the top of the vase. Then I slid the sweater up the vase and applied my 3-in-1 glue all over the bottom half of the vase. 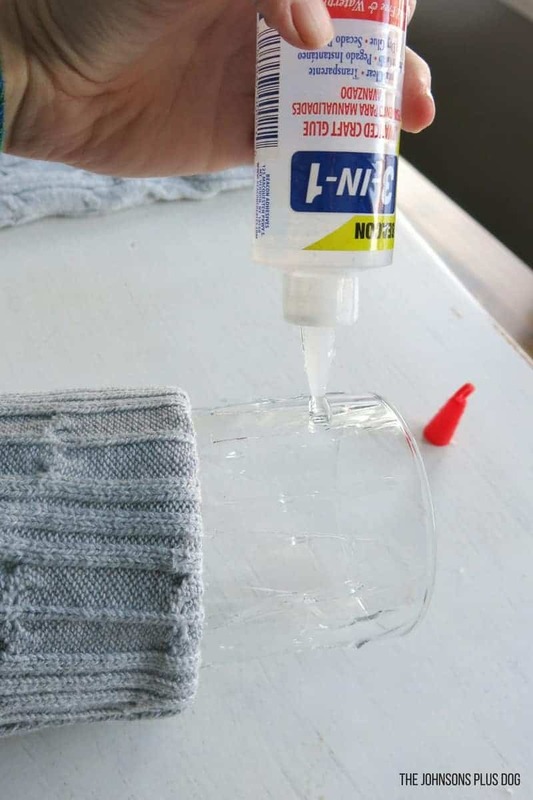 Gently slide the sweater back over the bottom half of the vase with the glue applied and rub about any wrinkles with your hand. 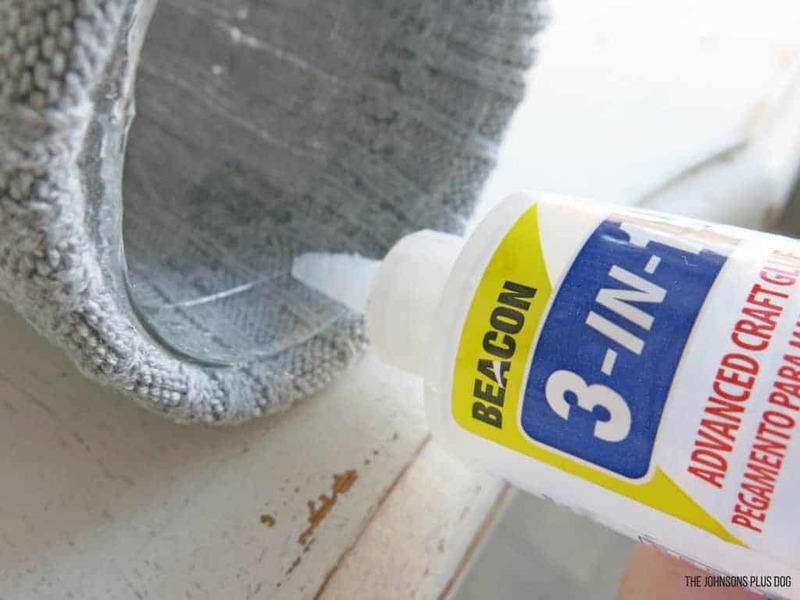 The 3-in-1 glue is able to moved around a bit before it sets. Continue applying the glue to the top half of the vase and roll it all the way up. Lastly, put glue on the inside edge of the vase in the top 1-2 inches. 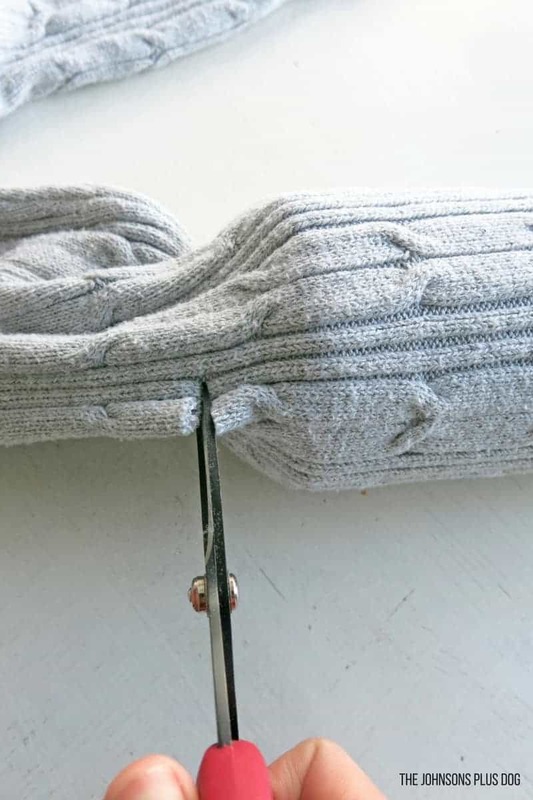 Then, you’ll just roll the extra sweater material over the top and inside the vase so you have a clean edge on the top. Isn’t that just the coziest of all vases you’ve ever seen?! 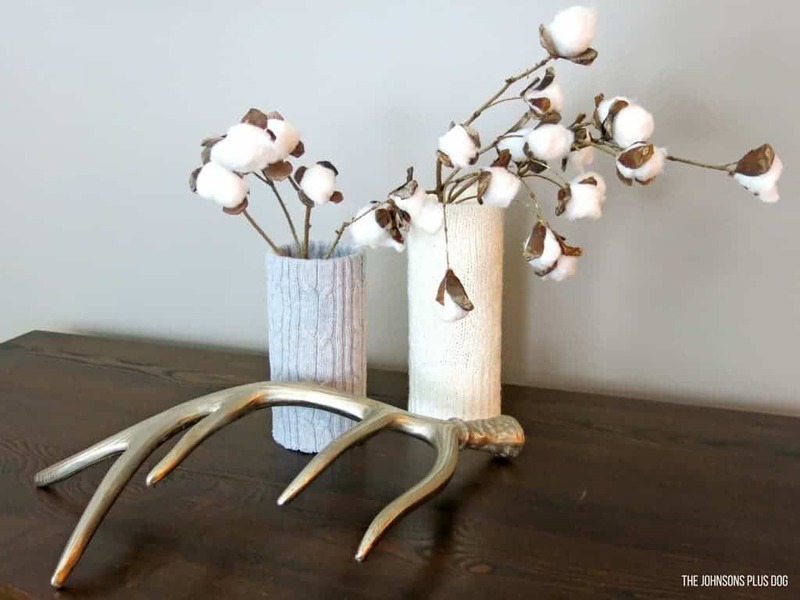 I love these for winter decor pieces! I used a gray sweater and then a white sweater for my others to keep it in the neutral theme. 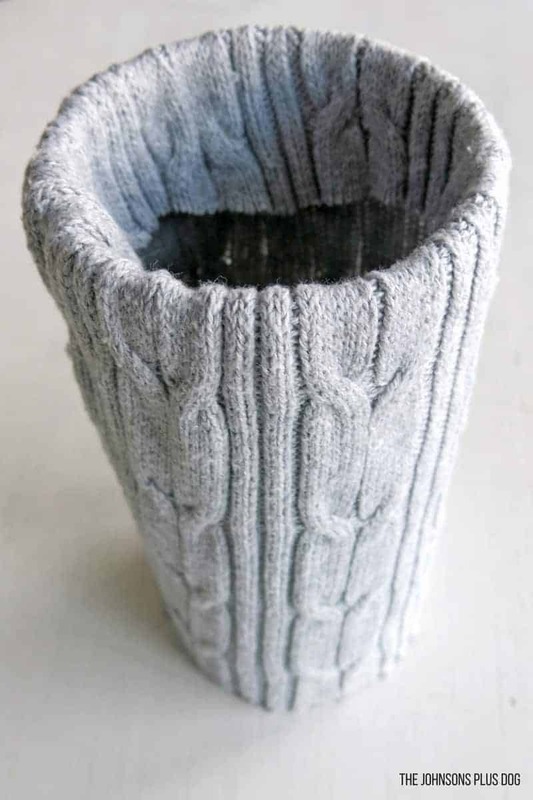 These sweater wrapped vases go great with the cotton stems, don’t you think?! I can’t wait to show you the rest of my winter crafts next week! You’re going to love them! UPDATE: You can find the video at the top of this post. ..let it snow, let it snow, let it snow!! !